This week has gone by so fast. Not much going on, however. I'm just waiting for yarn to start arriving for the Cast On garments. Several lessons arrived. Nancy's final project for the Finishing Class arrived. It was an adorable little girl's sweater. It was a joy to review. I spent some time working on a new concept for the correspondence courses. Stay tuned. Back to short rows...I use this type of short row all the time for socks. Back in 2000 or 2001 Priscilla Gibson-Roberts did an sock article in Interweave Knits on short row heels in socks. I'd never really cared for knit socks up to that point. I have a narrow heel and I found standard gussets uncomfortable, a bit like wearing a diaper on my foot. Her technique solved my sock issue and I have used it exclusively for any socks I design. You could use this technique for short rows in other types of garments. To turn the heel you work a yarnover at the beginning of every row. 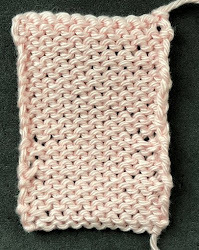 For knit rows you have to wrap the yarn over the needle before knitting the first stitch. For purl rows wrap the yarn under the needle before purling the first stitch. This leaves you with a stitch/yarnover pair. This photo shows the results. Salon will be on Sunday from 2-5pm. Hope to see you. I finished up the scarf. I wound up doing a running stitch around the edges to keep it flat. I think it looks better this way. I finished up the front of the wasp wing dress. It is exactly the same as the front. I'm now working on the sleeves and hope to finish it up this week.